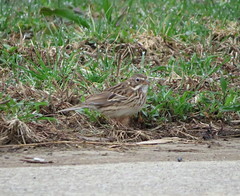 As a birder watcher I can reel off from memory all the places around the tri-state area where I go birding. And with it being the beginning of Spring I tend to narrow down my choices to a few prime locations where migrants show up. And Rowe Woods at the Cincinnati Nature Center isn’t one of them. Encompassing 1,025 acres, with 65 of them being old growth forest, one would think that it would be a great place to go birding. And with 16 miles of well groomed, award winning trails I’ve seen the bird lists that come out of there when birding groups visit. Very impressive. And it’s not like I’ve not been there before. On the contrary, my daughter was married there and I can attest that it’s a beautiful place. So what was the reason why I don’t bird there? Well, you have to be a member. And if you’re not a member it’s $9.00 admission. First, I didn’t want to become a member because I didn’t think I would get my moneys worth. When you pay for a yearly membership you feel committed to visit so you can feel like you’ve not wasted your money. And to just go for the day $9.00 seems a bit too much. Call me a tight wad, but that’s how I feel. Why pay to go birding, when I can go for free elsewhere. That was until my wife , while hiking with her hiking group at Rowe Woods, bought a years membership. So this last Saturday, before the crowds, we drove to the Cincinnati Nature Center so she could go hiking with her group, and I can wander around an do some birding. The air was cool as the sun rose and started to warm. Early frost was still clinging to the millions of Daffodils and all the other wild flowers that carpeted the forest floor. The birds were waking up as well as Tufted Titmouse were the dominate birds today. This trip also gave me an excuse to try my hand at macro photography. Like today birds were rather sparse, so if I came across a pretty looking flower, I’d get on my belly and see what this camera can do. Now don’t take me wrong, this blog isn’t going to turning away from the birds, however unlike my wife who’s busy hiking through nature, I’m absorbing it at all levels. From the tree tops to the fungus growing under a log. As a wandered along the trails that lead me back to the parking lot I couldn’t get this feeling out of my head. This place is so manicured it feels unreal. It doesn’t feel natural. I’ve birded in loads of places throughout my bird watching career, and I’ve never been to a place like this before. And I completely understand why have more than 150,000 visitors each year. Great educational programs, with a visitors center that is unbelievable, I will return. Rowe Woods is dotted with several ponds, and the Red-winged Blackbirds were busy building nests and protecting their territory. Birding was so-so. 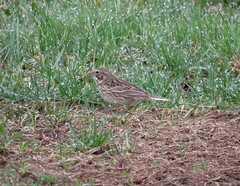 I feel migrants are starting to trickle into the area, but today. It was a chilly morning for the first day of Spring as Kathy and I climbed into the bird-mobile for a day of birding for me, and a day of hiking for Kathy with her hiking group. Today destination was Shawnee Lookout Forest, which Kathy hasn’t been to before and I haven’t been since last year. The sky was blue with very little cloud cover, so the hopes were for a quick warm up with decent trails. I dropped Kathy off at the Miami Fort Trail where her hiking group was meeting, an I back tracked to another trail so there would be less of a crowd. Little Turtle Trail was my choice. It’s really too early for any Spring migrants to be showing up, so for most of the hike I observed birds when they showed themselves, but for the most part I immersed myself in the beauty of the first day of spring. Tufted Titmouse, Northern Cardinals, Eastern Towhees, and American Robins, with a hand full of Carolina Chickadees were the dominate species I watch as I made my way along. This section of the trail runs parallel to the Ohio River way below my feet. I just love the greenish tint everything is getting while the trees are leafless. Wildflowers were just barely showing themselves in small patches adjacent to the trail. A Turkey Vulture drying it’s wings in the morning sun. I stumbles upon a small group of 7 or 8 roosting almost at eye level while on the section of trail above the Ohio River. Eventually my wife’s hiking group caught up to me. It seems after they finished their first trail they were in the need for more hiking, so they selected the trail I was on. It was about this time I was bringing my cameras up to my eye to snap off a photo of Fox Sparrow when the group showed up. And the bird spooked away. I did find the Red Bud just about ready to bloom. One more week of good weather should do it. For the most part it was a wonderful day just to be outside. The air was sunny and cool and the birds were very vocal. And just getting my bins back from Vortex where the rubber eye cup needed to be re-glued, I was anxious to try them out. So as the weather warms even more, my hopes to get out more and do more birding will increase. And as a added bonus, next month kathy and i are visiting our oldest son in North Carolina for a long weekend. And he has the location of a nesting pair of Brown-headed Nuthatches. Oh-boy, I can’t wait to bring you that story. Notable birds for the day include. For the most part the Brown Creeper (Certhia americana) can be found almost every State and parts of Canada, so why is it so difficult to spot these little brown birds. First off they short legs, long stiff tail feathers, long curved claws and toes with long dense feathers. And they’re almost always found on trees using their stiff tail as a prop as they feed usually starting at the bottom of a tree and spiraling upward. They’ll work their way to the top, then fly over to the next tree where they start the process over again. At about 5.3 inches they’re not as small as some birds, but given that they blend into the tree is what makes them so difficult to spot. I know that they have a very distinct, high pitched call, but for someone like me who has troubles hearing at certain octaves I tend to miss there call unless someone else points it out to me. And with the felling of the old growth forest, places like Kentucky their breeding population is listed as “endangered”. But what was the real thrill was while I was waiting for the Redpoll I noticed a small bird forage at the bottom of one of the trees in the background. A Brown Creeper and begging for it’s picture to be taken. 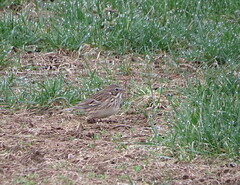 Granted it’s a blurry photo, however it’s easy to see how this bird can be overlooked when out birding. Since they spiral up as they feed, I had to wait till it came to the side of the tree to snap off this picture. They may not be very good photographs, but this is the first one I’ve ever gotten.